As a result of globalization and increased interaction across countries and cultures, multilingualism is becoming increasingly important all around the world. Script, as the most important conveyor of information, is at the center of this development. Designers are more and more faced with the challenging task to create advertising posters, signage systems, books or lettering, for example, that not only combine different languages but two or even more writing systems with varying visual precepts and habits. At first, important general aspects are documented and discussed such das sociocultural premises, technical requirements as well as practical considerations. All eight in-depth presented writing systems are then described by specialists in the field and illustrated by work examples from international designers and studios. 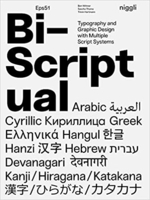 "Bi-Scriptual" provides a thorough overview of the various possibilities for the booming field of multiscript design to foster international communication.